How to realize hammer crusher output size adjustment in stone crushing plant? NewsHome > News > How to realize hammer crusher output size adjustment in stone crushing plant? Hammer crusher is features of convenient operation and maintenance in stone crushing plant,Hammer crusher important components are frame, rotor, grate, hammer head and motor. when hammer crusher works, motor drive through the belt pulley - triangle rotor, material resulting from the rotor rotates hammer head to material and material of the knock-on effect on the mutual impact and breakage.How to realize hammer crusher output size adjustment in stone crushing plant? 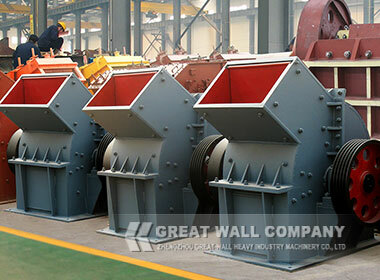 Great Wall hammer crusher technicians give the two ways to adjust hammer crusher output size. The adjustment of finished product particle size are vital for potential clients, they can make use of hammer crusher in road construction and mining industry.we can be achieved the goal by the following two methods.Firstly, we can change the grate style according to raw materials and detailed requirement on output size range.On the other hand we can change the grate gap of hammer crusher. we may embed filling block on both ends of grate frame groove. If you have other question on hammer crusher, please feel free to contact with our online service, we can give you satisfied solution soon. Previous: How to check and solve hammer crusher FAQs in limestone crushing plant? Next: What are detailed works for jaw crusher inspection and maintenance?